As I'm sure we all know by now, the deal where Disney has bought the asserts of 21st Century Fox has been approved. That means that Marvel properties like The Fantastic Four and The X-Men now have their movie rights back with Marvel Studios. This could not have come at a better time. As I've stated before, all of reality will be altered when those heroes who remain after Infinity War will try to bring back everyone. This allows for the perfect opportunity to bring these characters into the MCU proper. Just imagine, if you would, a scenario like I suggested way back when. The original Avengers, as well as the heroes like Rocket Raccoon who are still around, defeat Thanos. 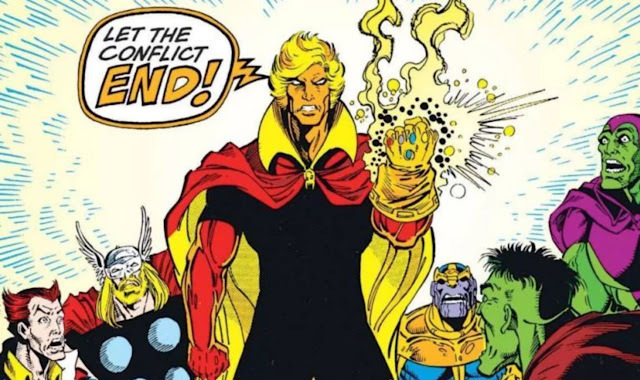 Adam Warlock or Nebula gets a hold of the Infinity Gauntlet and tries to set things right, but something happens and reality and time are warped. We get any new actors for roles like Iron Man and Captain America, but we also see Wolverine* (played by someone other than Hugh Jackman) and The Thing (hopefully in pants) in the crowd. No explanation is given, they're just there. Now we have a new starting point where anything can happen, because not all of the history up to this point had to have happened. This kind of soft reboot will allow for Hank Pym to have invented Ultron, or the Fantastic Four to have existed in the 1960's, or even Captain America fighting along side Namor & the original Human Torch as The Invaders during World War II. This gives them an "out" to modify what they need to, but not have to completely scrap what has come before. * This is assuming that the X-Men will be integrated with the MCU, which I would rather they didn't do since I think Mutants (and anti-mutant hysteria) work much better on their own. What one can really hope for is that if they approach the Fantastic Four again it will simply not be another go at the origin story. I always thought that the best way to approach that group was with the FF already formed - you get given their byplay and complexity of their relationships right off. If you have to explain origins of them or Doom, then do it in bits as short flashbacks. I also concur with keeping X-men separate since their storylines seem to be their own thing. Plus if the whole mutant hysteria is going, how does that play with someone like Thor or Spiderman -> wouldn't there be a general belief that that Spiderman is simply another mutant?